Surprisingly, the media have not picked up on this important issue. Maybe because the information is hidden in small print on page 415 of the voluminous report and omitted in the Summary for Policy Makers? The implications of the mismatch of model vs. reality may be serious: It is common practice in all fields of modeling to test models first on existing data, i.e. a known development, before using them as predictive tools. Models first have to pass the ‘hind cast’ or ‘history match’ before they qualify to be used for predictions. According to the IPCC, the climate models seem to have failed this test, appear to be on the road without driving license – so to speak – and are therefore unfit for future climate predictions. The main questions therefore are: How could it have been so warm one thousand years ago when CO2 concentrations in the atmosphere were on a low pre-industrial level? Which climate drivers could have triggered the MWP warming, that seem to be underrepresented in the current climate models? How would temperature prognoses change when climate models are used that fully account for the MWP warming? A robust documentation of the MWP forms the basis of this overdue discussion. Unfortunately, there are still voices in the debate that describe the MWP as a local phenomenon, or as a warm phase that globally was much colder than the Modern Warm Period of the 20th and early 21st centuries. There are still press releases written on papers that seem to disprove the MWP concept, even though these studies are outliers or may fit very well into the MWP scheme when considering the full context. 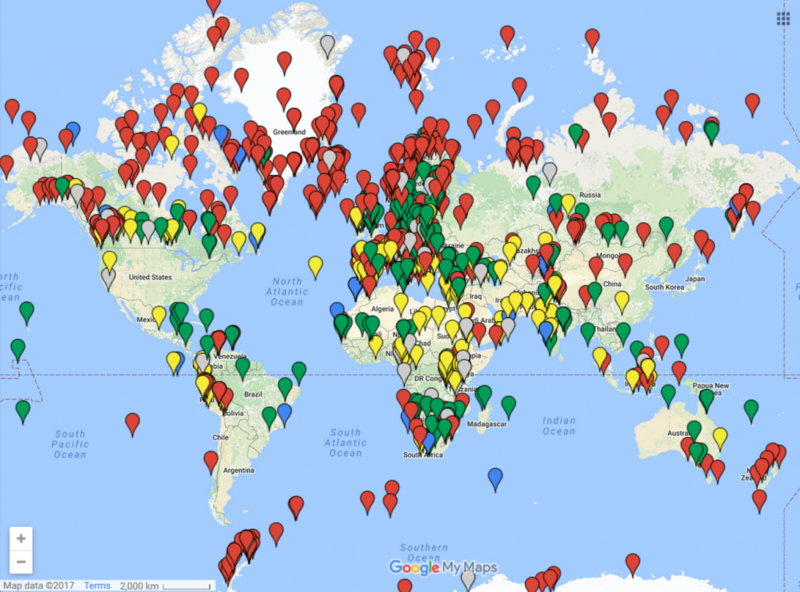 The current MWP mapping project aims to fully evaluate and provide reference access to the existing literature on the global climate history of the past 1500 years. The seed point is provided by the MWP summaries provided by the Medieval Warm Period Project by CO2 Science. Meanwhile, a large amount of additional, new literature has been identified. The data is visualized on a zoomable Google Maps platform which provides userfriendly access. A click on the respective datapoint opens an information panel which summarizes the results of the study using a common, simplifying scheme. Links to the journal abstract and key figure allow quick access to the data. If you like, try it out youself and open the MWP Online Map. The MWP Mapping Project will help to shed new light on a number of controversial issues: In which regions of the world has MWP warming been documented, in which areas is the MWP warmth missing? Are there regional trends with regards to the onset and termination of the warm phase? What shifts in rainfall did occur? The map is freely accessible on the internet in order to allow maximum distribution among all participants of the climate change debate. The MWP synthesis aims to serve as a neutral facts platform for discussions on the MWP and to provide important paleoclimatological context for modern climate change developments. The project has started in late 2015 and since then has made good progress. Initially, the focus was on regions with limited existing data to cover as much area as possible. A synthesis paper on the MWP temperatures in Africa has been published in 2017 in Paleoceanography. A paper on the MWP African hydroclimate came out in Palaeo3 in February 2018. The South America MWP temperature synthesis was published in Octover 2018 in Quaternary International. Most of western North America and Africa were experiencing drought conditions during the MWP (except some areas in Southwest Africa). In contrast, Australia and the Carribean was more humid. Globally, the majority of all paleoclimatic temperature studies compiled in the map so far show a prominent warming during the MWP. This includes Antarctica and the Arctic. The project requires time-consuming data acquisition, processing, research and map compilation which requires manpower processing support. Additional costs arise from IT, literature, and possible publication fees. The total project budget has been calculated at €25.000 (=US $27,180) which works out at less than US$ 4000 per continent. Currently, about 60% of the total project sum has been secured, donated through crowd funding. We hope for your active support to find the remaining funds to allow completion of the project. Please let us also know in the subject line, if your full name can appear in the official list of project sponsors (“list-Yes”, “list-No”). If you do not add “list-Yes” we will assume that you prefer to stay anonymous. € 200 Donation by M.P. € 20 Donation by T.S. € 25 Donation by A.S.